Quick and easy vegetable spaghetti that tastes so good, you won’t even realize it’s loaded with nutritious veggies. This vegetarian pasta recipe has over 1 1/2 pounds of vegetables. This spaghetti is so good, we could eat it every day. 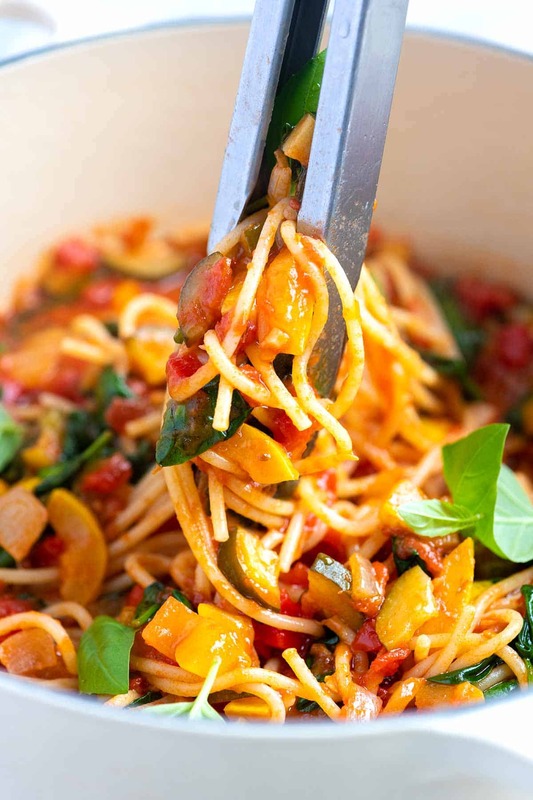 Jump to the Fresh Veggie Spaghetti Recipe or read on to see our tips for making it. 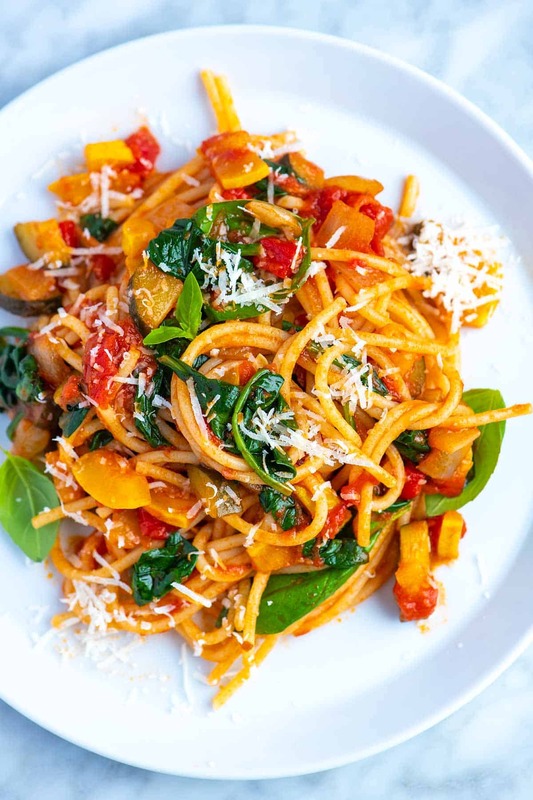 Think of this as a versatile vegetarian pasta recipe that works wonders with a variety of vegetables so you can use whatever you have in the fridge. I like to think of this as a great way to use up any veggie scraps left in the produce drawer. You can even swap out the spaghetti for other pasta shapes and types. Whole wheat and even gluten-free pasta will work beautifully. My favortie thing about this vegetarian pasta is that it’s made 100% from scratch so you know every ingredient that goes into the pan. If you are looking for a low-carb pasta recipe, try our Guilt-Free Zucchini Noodles. We swap pasta with noodles made from zucchini. See how we do it using a spiralizer or if you don’t have one, see our tips for using a mandoline or vegetable peeler. Pasta — Any shape of pasta will do and you can swap in your favorite gluten-free or whole grain pasta if you’d like to. Vegetables — The type of veggies are up to you, but we love zucchini, yellow squash, jarred roasted red peppers, leafy greens, peas, corn, and cabbage. Options are endless, here. Onion, garlic, and tomato paste — These provide a base flavor for the simple sauce. Canned whole tomatoes — You can use diced or crushed tomatoes, but we love the texture of whole tomatoes for this recipe. Just after adding them to the pot, we crush them a little with a spoon so they fall apart into a chunky sauce. You can also use blanched, peeled fresh tomatoes. Herbs and spices — When we have it in the kitchen, we add fresh basil. 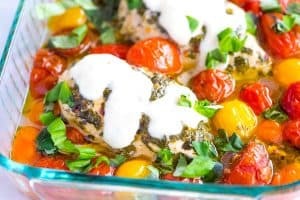 Other herbs work, too (parsley and mint add a different flavor, but are excellent). Dried herbs like oregano, crushed red pepper flakes also make the sauce delicious. Mushroom powder — Okay, now this one is optional, but for the best, most flavorful vegetarian pasta, we highly recommend using mushroom powder. It adds a rich umami flavor to the sauce and is our secret weapon when making meatless recipes. We’ve used it before in our recipes (see our gravy recipe). You can make it yourself (instructions are below) or buy it. Trader Joe’s has even started to sell their own version. We have provided a few alternatives in the notes section below. Making this pasta loaded with vegetables is simple, better yet, it’s fast! Soften chopped onions in olive oil over medium heat. Stir in garlic, spices, and tomato paste. Throw in your vegetables and cook until tender. Add canned whole tomatoes and break them up a bit with a spoon. You want the sauce to be chunky. Season and then simmer the sauce until it’s reduced slightly — somewhere between 10 and 15 minutes. While the sauce simmers, cook your pasta. Toss the pasta with the sauce and serve. 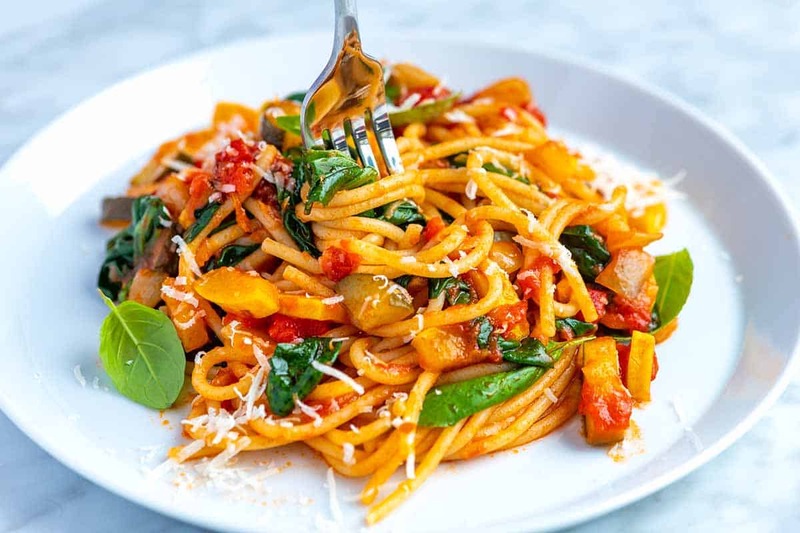 I love serving the spaghetti with a generous amount of parmesan cheese, but if you are vegan, try sprinkling a bit of nutritional yeast on top instead. Our Fresh and Easy Vegetable Lasagna is one of our most popular recipes! Our Meatless Baked Pasta will please vegetarians and meat lovers alike. With only 15 minutes of hands-on time, our Easy Baked Ziti with spinach, artichokes, and a creamy pesto layer is perfect for busy nights. We love veggies around here and set out to create the best vegetable packed veggie burger! 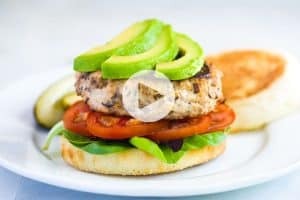 These delicious Veggie Burgers are high in fiber (5 grams) and come in at just over 200 calories for one patty. Another healthy dinner recipe, these Easy Roasted Veggie Tacos are packed full of spice-roasted vegetables and black beans for a bit of protein. For a meat-based spaghetti recipe, try our Easy Weeknight Spaghetti with Meat Sauce. 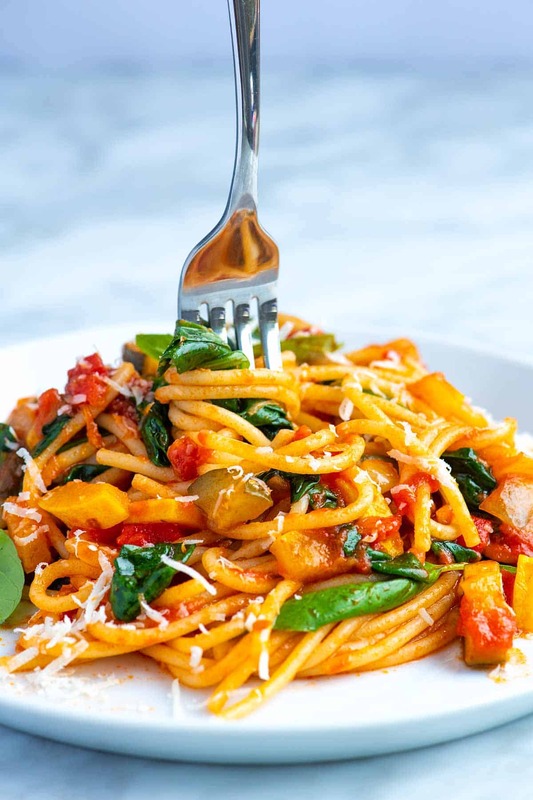 Quick and easy vegetable spaghetti with lots of veggies and a simple tomato sauce made completely from scratch. For vegan spaghetti, skip the cheese and serve with a little nutritional yeast scattered on top. The sauce can be made in advance and kept in the refrigerator for 3 to 4 days. Heat olive oil in a wide skillet with sides over medium heat. Add onion and cook, stirring occasionally until translucent; 3 to 5 minutes. Add the roasted red peppers, tomatoes, and mushroom powder. Bring to a low simmer and cook until the liquid has thickened and reduced by half; about 10 minutes. As the sauce cooks, use a spoon to break up the whole tomatoes into smaller pieces for a chunky sauce. While the sauce simmers, bring a large pot of salted water to the boil then cook pasta according to package directions. Take the sauce off of the heat, and then stir in the spinach and basil. Taste then adjust with additional salt if needed. 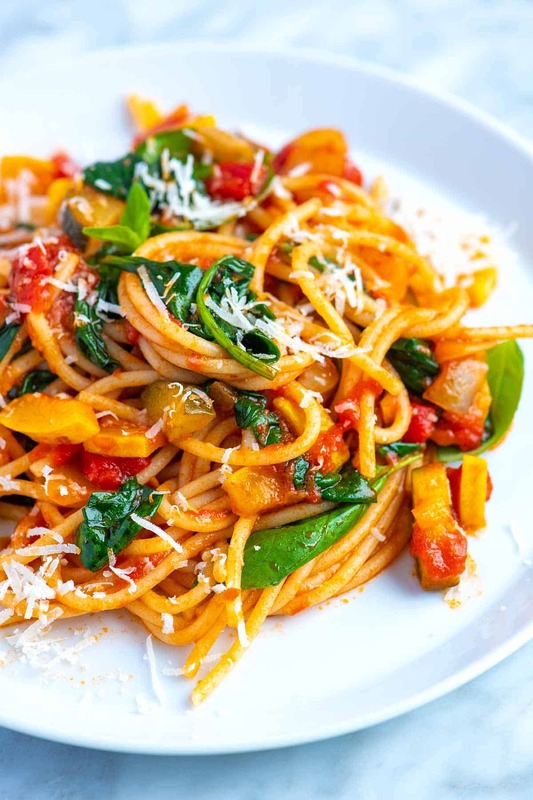 Toss in the cooked pasta, and then leave for a minute so that the pasta absorbs some of the sauce and the spinach wilts. Toss again, and then serve with parmesan or nutritional yeast sprinkled on top. Mushroom Powder: You can buy it online or make it yourself. Start with dried mushrooms — any type of mushroom will work. We particularly love dried porcini. They are sold in large or specialty grocery stores, or you can buy online. Throw the dried mushrooms into a blender and blend until ground. Store in a spice jar and use to your heart’s content. Alternatives to mushroom powder: Mushroom powder adds a rich umami flavor to the sauce. If you do not have any and the pasta sauce seems like it needs a little extra “something, something,” try a dash of soy sauce. If you are open to it, fish sauce is also an excellent flavor enhancer. Would sautéed mushrooms give the same umami as dried mushrooms? I absolutely love, mushrooms, of any kind. They are very good for you too. Mmmm, 😋Yummy! Adding mushrooms to this is a fantastic idea. They won’t be as strong in flavor as dried, but delicious nonetheless.